Jordan Haglund of Masterton with her hawk Jack, which she has raised from an egg. Spreading its wings in a living room must be strange for one of New Zealand’s great soaring birds, but open skies are beckoning. 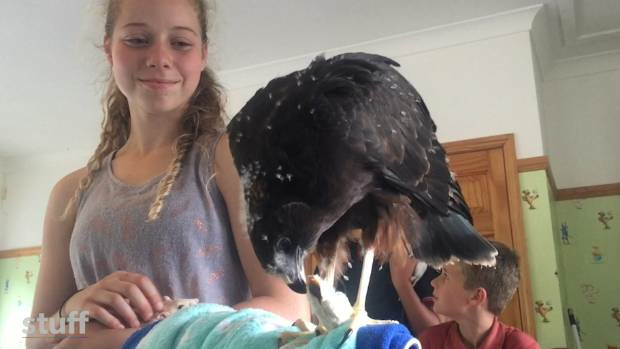 Jack the New Zealand harrier hawk (kahu) has been raised from an egg by a Masterton teenager with a passion for birds. Such was Jordan Haglund’s love of raising chicks that she got an egg incubator for her 14th birthday in November. Jordan Haglund with her almost fully-grown hawk Jack. Not long after, she was given a couple of harrier eggs by dairy farmer friends who had saved them from being trampled in a paddock. Jordan’s mum Nicola is a vet and was able to give some good advice on how to raise the bird, which is one of New Zealand’s apex predators. The baby hawk enjoyed human contact as a chick. “Mum didn’t really want a hawk because she knew they were hard to look after. You have to feed them the right foods and teach them to hunt,” Jordan said. Though Jack has certainly exhibited hunting tendencies, it is not an aggressive bird and has been a welcome member of the family. Now only six weeks old, the bird’s adult plumage started emerging just a couple of weeks ago. Jack the kahu getting some kip. Rather than the ungainly long-legged chick with grey downy feathers, Jack now cuts quite a majestic figure perched on a chair at the living room table. Jordan has raised a variety of birds since she was a small child. Her backyard in rural Masterton is teaming with ducks which follow her around like a mother hen. Jack the hawk was raised alongside six runner ducks and his loyalties towards his step siblings may soon come in conflict with his natural instinct to hunt. The hawk hatching from its egg after being in the incubator. He landed on the cat the other day, which gave the poor puss the fright of its life and it has made itself scarce ever since. Jordan understands that native birds are not permitted as pets and she has consulted with a local expert who rehabilitates them for the Department of Conservation who said the hawk would probably leave the house when it is ready to fend for itself. The call of the wild has been growing louder and even though the maturing bird only started spreading its wings a few days ago he is already flying off from the house during the day and returning in the evenings. Though christened Jack, no-one’s sure of the gender of the bird. Given it has grown quite large, it could quite easily be a female, which are generally 30 per cent larger than males. The Haglund household is home to a menagerie of animals; cats, dogs and pet rats live in harmony, a large flock of ducks roam free outside and chickens compete for the scraps.